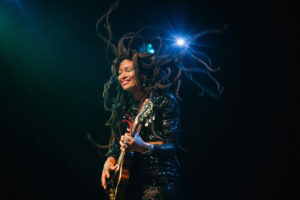 With her 2013 breakout album Pushin’ Against A Stone, Valerie June went from being Tennessee’s best kept secret to being hailed by The New York Times as one of America’s “most intriguing, fully-formed new talents.” A singer-songwriter who blurs the lines between folk, soul, country, R&B, and blues, June has graced some of the world’s most prestigious stages from the late-night talk show circuit to Carnegie Hall to the White House. Her 2017 album The Order of Time was met with continued acclaim. June has toured with artists like Sharon Jones & The Dap Kings, Sturgill Simpson, Norah Jones, and Jake Bugg in addition to flooring festival crowds at Bonnaroo, Outside Lands, Newport Folk, Hangout, ACL, Pickathon, Mountain Jam, and more.